Lots of news to catch up with. Having done my own painting for... well, forever... I'm amazed at how fast a full crew of professionals can move. We've had a few down days for weather, but for all that, the progress is nothing less than breathtaking. I will try to take you through the process. Last time I reported that Howdy and the boys had finished soda-blasting the bottom down to bare steel, and finished priming. They primed the hull with four coats of black Bar-Rust 235. "A high performance, multi-purpose, surface tolerant, two-component chemically-cured epoxy semi-gloss coating." Then came a grey 'tie coat', also Bar-Rust, but a different color as a signal. Once the hull was effectively barrier coated, it was time to apply anti-fouling -- five coats of ABC-3 bottom paint, an ablative paint much used on steel commercial boats, and the Navy. According to Howdy, and the data sheet, this paint is "Capable of 60-month performance". That's five years, folks. Of course, you need lots of material, which is why we went with five coats, at two gallons per coat. Gulp. But if I don't need to paint the bottom for five years, I will be more than satisfied. What is a 'tie coat'? Don't feel bad, I didn't know either. In this case, the tie coat was a coat of light grey Bar-Rust which was left to dry until just tacky. The first coat of ABC-3 was then immediately applied. Since the tie coat was not completely dry, the two paints mingled chemically, 'tying' the two paints together with both physical and chemical bonds. Pretty clever, right? 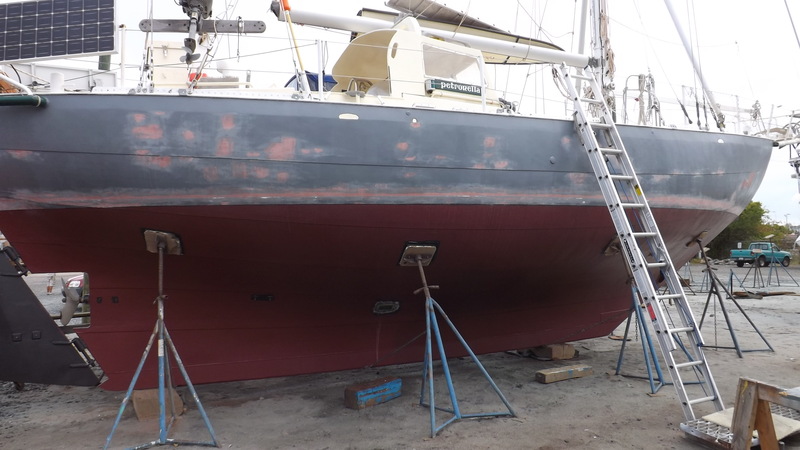 Here we see the bottom with several coats of anti-fouling paint already on, and with work begun on prepping the topsides. After testing the old green topside paint for compatibility with the new epoxy red paint, Howdy discovered that the two paints were NOT compatible, so off came the old green paint. In the photo above, the topsides have been primed with more Bar-Rust. With a bit more work, the topsides were fully primed, and the bottom paint completed. Sharp-eyed readers will have spotted an odd shape on the bottom, in the second photo, above. After blasting off all the bottom paint, Howdy spotted some pitting in the hull which had been hidden by 40 years of bottom paint. This corrosion came from the inside, of course. Petronella had a water pump that John, the previous owner, kept alive for many years by periodically re-building it. However, it leaked enough so that salt water collected against the hull in this specific spot, and gradually corroded it. A reminder, if one was needed, to cure internal leaks fast. I've got that one written on the back of my hand now. Thinking of getting it tattooed. Anyway, Howdy cut out the rusted piece, and welded in a new piece. The photo above shows the patch playing catch-up with the painting cycle. Though I would have been happy to pick up a paint brush, Howdy didn't seem to want a complete novice on his team (frowny face), so I had to find my own projects. One of them was a sadly neglected tiller. I mean, the tiller only steers the whole boat, right? I think it deserved a bit of TLC. Howdy looked doubtfully at this poor piece of wood, but I thought there might be something worth saving under all that peeling varnish. After removing the old varnish with a heat gun, and a bit of sandpaper love, a nice teak tiller re-appeared. It's a miracle! Here it is after drinking in the first coat of varnish. Not a very good picture, sorry. I will supply a better one when it's done. I'm also building a new boat hook from an ash pole and a bronze hook, to replace the one that was stolen right off the boat. I started varnishing the pole alongside the tiller. The tiller has some sort of fiberglass 'side cheeks'. Not sure what to call them, because I'm not sure what they are for. They are unpainted, but unprotected fiberglass will eventually breakdown under the hot tropical sun, so I'm going to paint these odd side cheeks white after I'm done varnishing. Finally, today was the day I'd been waiting for -- the day for the first coat of red paint! It was a clear, dry, painting day. Perfect for restoring Petronella to her original color. Here are the boys rolling and tipping the first coat on. This bright color is, as mentioned before, a color called Rochelle Red. A color I like to believe was named after the original Joshua (now in the Maritime Museum in La Rochelle, France) which was the same bright red. In prepping the boomkin, Howdy's team removed some rope work which revealed a patch of red paint. Author Les Weatheritt, Petronella's second owner, told me that he painted Petronella green because he got tired of the original red fading on him. If we assume the paint on the boomkin was faded when the roping was put on, then the colors look like a pretty good match. While the first coat was drying, Larry -- who has worked with Howdy for 20 years -- started on the black trim paint. There will be a lot more of it before he's done, but it's a start. The more I think of it, the smarter I think the original Joshua color scheme. The red will make Petronella very visible at sea. She's already pretty visible in the boat yard! And the black will hide the worst of the rust stains, which tend to occur where the shrouds and stays attach to the boat. So that catches us up with most of what is going on. There are several side projects that I am working on, but they will have to wait for another post. The fiber glass on the sides of the tiller will stiffen the tiller a good bit. Ah, good thought. You must be right. Lots of stress on that tiller, which I don’t believe is original. The rudder head was designed for a meatier tiller. I will build a better tiller when I have the chance. A few days, actually. They are doing the second coat of red today, and the black boot stripe and trim should follow on quickly. Pretty exciting! Looking fabulous! That's a really bright red. Love it. Thanks, Bob. She’s going to be in great shape when she’s splashed. The new paint should help her along towards the next 40 years.